Like so many worthwhile endeavors, UTR was born out of necessity. In 2010, Jim and Tom both lost their livelihoods and had to literally reinvent themselves to survive. Jim was head of national sales for a big radio conglomerate, and Tom was flying around the country producing automotive videos for Detroit’s “Big Three” car companies. When the auto industry took a serious slide, Tom lost most of his income and was slowly going broke. On President Obama’s inauguration day, the company Jim worked for laid off half it’s workforce nationally. Here they were two longtime friends up the financial creek without a paddle. 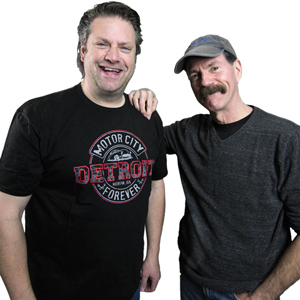 And, when we say long time, we met in 1982 when we were both getting our work feet wet at 101.1 WRIF radio. About 10 years ago Tom attempted to produce and host a kids TV show called “Bob’s Job.” The program was a career series that showed kids different jobs, and what its really like to be a grownup. Tom produced three episodes that were aired on Detroit Public Television, but the project eventually faded away due to lack of funding. Jim and Tom decided, what the heck, let’s go see if together we can resurrect the kids show with PBS. While meeting with PBS they were told that PBS was not interested in more children’s programming. Jim and Tom are both huge fans of where they live, and of any and all travel shows. So, after a few blank stares, dramatic pauses, and a couple swift kicks back and forth under the table. Jim and Tom said, “how bout a Michigan exploration program, where we travel the state discovering and uncovering cool people, places and things that people don’t (but should) know about?” Well, their eyes widened as they said, “make it, fund it, bring it back, we’ll broadcast it, and they will come.” We’ve been having an amazingly fun and rewarding adventure ever since.